Some situations can be particularly strong triggers for anxious thoughts and feelings in children such as on the way to kinder or school and when the parent leaves (separation anxiety) or when a routine is interrupted (such as a change of teacher), or in social situations such as birthday parties, or when a child is away from home such as on excursions and school camps. Children express their anxious feelings in different ways, for example, some children may become quiet and withdrawn, and others may become loud, angry or agitated. As a parent you can become very skilled at noticing the signs that your child is beginning to feel worried, and you may find it very helpful to have some mindful, relaxing, distracting or soothing activities already in place in the daily routine. Using Anxiety Solutions for Kids cards, encourage your child to select a card each day or week, preferably around the same time of the day. (It may be overwhelming to put out all the cards so you may want to select four or five for the child to choose from.) Doing it regularly helps develop a habit and an expectation—a calm, fun time where you do something together which changes the focus and teaches the skills of self-soothing. It could be a time when the child is most likely to feel anxious or unsettled in the day, such as just before bed. Complete the activity on the card together. The Colour of Calm: What about the sound of calm? The smell of calm? The feel of calm? 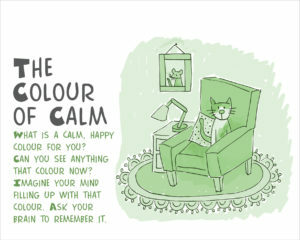 Can you find a crayon or paint colour that best matches your calm colour? The Feel of Fabric: How else can you explore the fabric with your senses? Smell it? Feel it with your feet? What is your favourite piece of clothing or fabric to touch or wear (for example, a favourite pair of socks, a pillowcase, a soft toy, an old shirt, a mohair blanket)? Remote Control: Draw or make out of cardboard your own remote control to ‘dial down’ worry and ‘dial up’ calm? 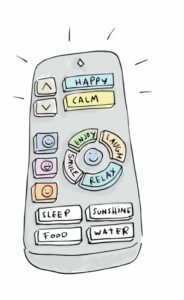 What buttons would be on your remote control for your body and brain? Always ask your child for their ideas first and give them a go! Choose your three favourite cards. What do you like about them? Can you make up your own names for these cards and draw your own pictures? Choose cards for things you have done before. When did you do these things? Who with? Did you like doing them? Do you still do them? If you have stopped, are there any activities you would like to start doing again? Parents can also place a relevant card in a child’s lunchbox, or on their pillow, or on a noticeboard as a gentle reminder. Try the ‘Better Than Before’ card. This activity is great for children who may find it hard to name something they are good at, but they may be much more able to name things they are; ‘better at than before.’ This helps them see that they are learning and growing all the time. Also, ‘Being Me’ is a very good card for those children who may be feeling anxious about being different. This activity encourages children to celebrate their own uniqueness and be inclusive of others’ differences as well. Even though Anxiety Solutions for Kids cards have been designed with kids in mind, many of the strategies for managing anxiety are essentially the same for adults, so you may want to do these activities alongside your children, or pick some to do later in your own time!